Today I’m going to prick our collective conscience. I wonder what your first thought was when you looked at this image: were you evaluating the quality of the composition and the processing like you normally do? Or were you thinking: what’s the story behind this image? 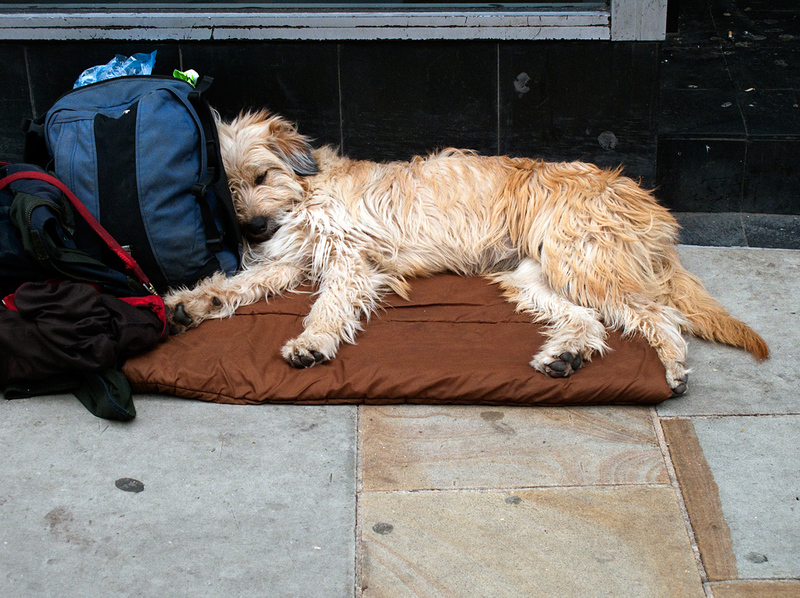 This is the dog of a homeless person, maybe even of someone forced to sleep rough because there was no room at the cheap B&Bs, hostels or other temporary accommodations. Data published yesterday classifies 44,160 households in England as ‘Homeless’. In London this Christmas, ‘Crisis at Christmas’ is braced for its busiest Christmas with more than 3,000 people expected to seek shelter at its centres across London. And it’s reported that nearly 4,000 people have slept rough in the capital alone in the past year, an increase of 8%. Those are shocking statistics. But they are likely to be far worse in some other countries. It’s a sad fact that the Christmas and New Year period only further polarizes the divide between the rich and the poor. At one end of the scale there is the conspicuous over-consumption, excesses, celebrations and partying with friends of the ‘Haves’. And at the other end there are the ‘Have Nots’ whose plight is amplified by the shut down of all the essential day-to-day services on the High Streets of our towns and cities, that isolates them further and makes their already grim existence even harder – and all at the coldest time of the year in the northern hemisphere. So what do you do when you spot a Homeless person, sitting against a wall on a busy street, wrapped in a sleeping bag? Do you pretend not to notice, ignore him/her, or walk by on the other side? I confess I’m as a guilty as the next person of doing just that. Maybe you don’t consider giving because you think that person is likely to be an alcoholic or a drug addict, and by giving you are just paying for the next bottle or fix? Maybe you reason it’s not your problem? Maybe you wonder: is this even a genuine Homeless person? There will be times when some of those concerns could be justified. But increasingly these are ordinary folk – not unlike you and me – fallen on bad times: victims of the recession; a combination of debt, unemployment and eviction. Would anyone be out there on the streets in all winds and weathers of their own volition? I have no idea where the owner of this dog was when I passed by, or how he came to be there. Maybe he’d gathered up the few coins thrown his way and gone down the road to buy a hot drink or a snack. What can – should – we do? We can empty our pockets of loose change: will we really miss it? If we are uneasy at fuelling an addiction we can offer a coffee from Starbucks or a pastry from the Bakery instead. Or we can donate to charities for the homeless. There’s a guy I pass regularly, camped outside Milton Keynes station – I’m committing myself to emptying my pocket onto his sleeping bag before Christmas Day. What about you in your neighbourhood? Have I pricked your conscience? I know that by writing this I’ve actually pricked my own. Please do something to help. This entry was posted in The Human touch and tagged Crisis at Christmas, Homeless, Shelter, Sleeping Rough. Bookmark the permalink. Nice writing, Andy. It’s a good piece to think about during the holiday season, and well beyond. I hope that what you’ve written causes people to help out more. The dog’s rather cute, too. Really nice post Andy! One to make you think. 7 times in 30 years, I’ve been that homeless person. I have friends who are probably sleeping outdoors, tonight. Thank God for the shelters and food banks. My first thought was “what is this dog’s story”?? I have to be honest, I do ignore them most of the time, although I secretly want to talk to them, find out their story, but the some food. Maybe this year I will try and do more of that. We should never turn a blind eye on the ones that need us most. Happy Holidays to you. Thank you for sharing this story. Actually, I just thought “what a lovely dog” and how he reminds me of one of my own dogs, his head propped up like that when he sleeps. I have been known to buy tins of dog food or doggie chews for homeless people with dogs. By helping the dog I hope I’m helping the homeless person too.